Marika’s Cottage is located in the beautiful village of Makriotika. 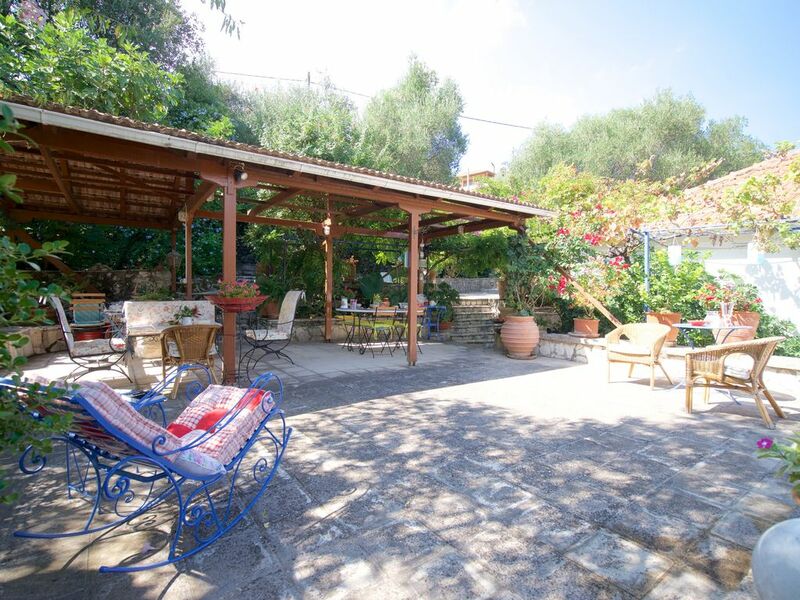 It is a cottage of 82 ㎡in a land of 1000㎡, totally fenced, with private entrance and private parking, among olive trees, pergolas, fruit-bearing trees in a nicely ornamental garden and view to the mountains and the sea. Its strong point is the surroundings with traditional elements and nice spots for total relaxation, serenity and enjoyment. It is located in the center of the island, perfect spot for your excursions. Marika’s Cottage has 2 Bedrooms, 1 Living-room, 1 Dining room. There is also a covered yard with Dining room, Lounge and Barbecue for breakfast, coffee and meals. There are also 2 patios with loungers for sunbath and relaxation and lounge for your evening drink. There is also an outside shower. It is bright, quiet, with modern comforts. The village keeps its authenticity and has quiet tourism. In Agia Efimia you can rent a car or a motorbike. You can also rent an engine boat to explore bays that have no access with car. Enjoy hiking, horse-riding, scuba diving (there is a school for scuba diving), fishing, and the local specialties. You can also watch or participate in local festivals. Visit Ainos, the highest mountain of Kefalonia with panoramic view, Assos with the graphic port and the Venetian castle and also the traditional and cosmopolitan Fiscardo. From Agia Efimia you can also go by cruiser to mythical Ithaca. In a small distance (100m) you will find the village square with 2 taverns, cafeteria and mini market. In 1klm distance you will find bakery, gas station and super market. It is a very quiet neighborhood. In 5 min drive you will find the beaches of Agia Efimia. Enjoy bays, caves, ruins and spectacular drive to Sami and Fiscardo. My mother and I will welcome you. We can speak on the phone for anything you need. You can keep your luggage in the yard when the arrival is too soon or the departure too late. We are waiting for you to enjoy our island, the hospitality of its people and to experience unforgettable vacation. Hello, I am Panos. I was born in Athens and spent many happy summers in Makriotika, the village of my mother. I love walking, travelling, chess and dance. Marika's Cottage is my mother’s family home and our cottage. We renewed it with love and we offer it to you with love. This property offers many services to couples or families for comfortable and beautiful holidays. Comfortable living/dining area to seat 5 persons, with sofa bed. Fully equipped luxury kitchen, with sink, fridge/freezer, cooker hob, cooker oven, toaster, kettle, microwave oven, coffee machine, iron and ironing board. Notes on accommodation: We supply a free welcome pack on arrival. Outside: Fully enclosed by a gated fence, the cottage benefits from large patio areas with BBQ facilities. Cleaning / Towels / Linen / Maid service: Towels (excluding beach towels) and linen provided. The property is cleaned at the change day. Towels and linen are changed by the renters when ever they like, without the need of cleaning them. Maid service during a stay can be arranged by request. The owners mum Marika was lovely and her gifts throughout our stay were really nice and unexpected. Amanda and Marika were there to meet us,even though we arrived during a torrential downpour but we were quickly made to feel very welcome. Within walking distance of the cottage there is a family run restaurant serving local specialties with a friendly warm atmosphere which we would highly recommend. Apart from the fabulous opportunities for water based sport, including scuba diving, yachting and swimming in the summer, during the off-season periods (May and October) there are a variety of outdoor activities that can be used as a basis for special interest holidays for horse trekking, walking, bird watching, painting and photography. This makes Marika's Cottage an ideal base for nature lovers and out-door activities. A 10 minute drive from Marika's Cottage is Myrtos Beach - voted one of the top ten beaches in the world. In Aghia Efimia, 5 minutes driving from Makriotika, there are numerous small beaches and coves. Kefalonia Island’s airport (EFL) is about 45km from the village with many daily direct flights and 4 daily flights from Athens The island's main port is Sami, 14km away. A car hire is highly recommended since there are numerous places of interest. Kefalonia Airport is approximately one hour's drive from Makriotika. Sami port is 15 mins drive. Recommended places to visit include: Argostoli (35km), Assos (10km), Fiskardo (40km), Skala (40km) and Poros (35km). Local villages, such as Dendrinata and Drakapoulata, offer an insight into unspoiled Greek rural life and numerous buildings and sites of historical interest. We recommend a trip to Mount Enos, Kefalonias highest mountain, to enjoy spectacular panoramic views of Kefalonia and other Ionian Islands. Stop for some local wine-tasting at the village of Frangata. Agia Efimia has several supermarkets, bakeries, a post office, a pharmacy, ATM, numerous taverns, bars and coffee bars. One can hire cars and mopeds and motorboats in the village and book tennis courts and scuba diving. The municipality of Pylaros, in which Agia Efimia is located, offers numerous enchanting walks both in the valley and the surrounding mountains with breathtaking views and wonderful varieties of flora and fauna. Follow the mountain road to Myrtos Beach, then wind down in the atmospheric little harbor of Assos. Take a boat trip from Sami across to nearby Ithaca or take the twice-daily boat trip from Fiscardo to explore Lefkas. Changeover Day: Preferred day of changeover is Sunday. Deposits and final payments on holiday costs are non-refundable. (Deposit or cancellation refunds could also depend on whether or not we are able to re-let the holiday period).